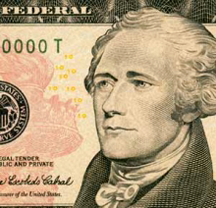 A portrait of Alexander Hamilton, first Secretary of the Treasury of the United States, as it appears on the U.S. 10-dollar note. Born on the island of Nevis, British West Indies, January 11, 1757, he emigrated, at the age of 15, to what was to become the United States. He led an illustrious political career, which included a long-running and progressively more bitter feud with Aaron Burr. In 1804, Burr challenged Hamilton to a duel, and though Hamilton was reluctant to participate, and attempted to settle the challenge by alternate means, the standards of honor of the day led him to meet Burr on the dueling grounds of Weehawken, New Jersey, on the morning of July 11, 1804. Both men fired their pistols, but Hamilton missed. He was struck by a shot from Burr's 0.56 caliber dueling pistol, and died the next day. A sitting Vice President, Burr was indicted for murder, but he was never tried, in part, because he fled to South Carolina. His career later ended in disgrace, following an increasingly bizarre chain of events that led to his acquittal on a technicality on charges of treason in 1807. In analogous social circles today, duels, in their violent form, are rare, but they persist in verbal form in most organizations. In dueling incidents, the challenged often feel as boxed-in as Hamilton felt in 1804 — equally damned whether or not they decide to engage. And today, as in 1804, the careers of both participants in duels are in jeopardy, win or lose. Read more about the duel between Burr and Hamilton. Photo courtesy United States Treasury. Communication templates are patterns that we all know and use together. When we initiate a communication using a recognized template, we expect responses within the bounds of that template. Most communication templates are innocuous — you can review some examples in "Communication Templates: I," Point Lookout for February 6, 2008. And then there are the less innocuous communication templates. They create problems both for the initiator and the responder, though the problems are different for each. For example, when one person insults another, many regard an equally insulting reply as "justified," whether or not returning another insult would be constructive in that context. The initiator's problem is the received insult; the responder's problem is that a reflexive insulting response might be less effective than a more diplomatic and powerful alternative. Here are three examples of communication templates that are generally destructive. The sender creates and sends an angry, snide, or abusive message; the recipient responds in kind. Back and forth they go, escalating in tone and risk. As either sender or recipient, making a phone call or a personal visit would be far more constructive. If that isn't possible, arranging one by email is a second-best choice. As the recipient, another option is ignoring the message, if it can be ignored. If the message is part of a pattern of sender-initiated angry exchanges, seek advice from your superiors. What if the sender is your superior? That will have to be another article. Excluding someone from a meeting or conversation in an obvious manner conveys a message. Within the template, the excluded fights to be included, or retaliates with a similar exclusion move, or accepts lowered status. Rarely does the excluded approach the excluder to talk about hurt feelings, or the harm to the organization or degraded morale. Although analogous conversations among peer confidants can be soothing, they're usually ineffective. On the other hand, almost any action taken by bystanders, on behalf of the excluded, would be helpful. When bystanders fail to act, they give the excluder a free pass to use the tactic again. Reminding those over whom we have organizational power that we can exercise that power can be a form of threat. The subordinate role in this template is one of deference. We defer, we placate, we hide and we deliver only the good news. Power flaunting encourages slavish devotion and concealment of truth. It discourages risk taking, creativity, innovation, proactive damage control, and questioning the status quo. In organizational terms, it is one of the more expensive templates in use. Remaining in organizations where power flaunting is common is career-risky. Supervisors who notice power flaunting among subordinates would do well to intervene. Would you like to see your comments posted here? rbrennunOfOcFUFikrGwbner@ChacsbDxldwsWvkPzgOxoCanyon.comSend me your comments by email, or by Web form. See also Effective Communication at Work and Conflict Management for more related articles. I offer email and telephone coaching at both corporate and individual rates. Contact Rick for details at rbrenWoSBlPiPCNLthYrQner@ChacHmwxXoYDKWKZmJoCoCanyon.com or (650) 787-6475, or toll-free in the continental US at (866) 378-5470.